Do you know what's orange, weighs 1810 lbs., and needs to be transported via flatbed truck? If you guessed my 1967 Volkswagen Beetle, you'd be two thirds right. The bug actually weighs 1900 (without me in it). No I am talking about the current record holder for world's largest pumpkin. That's right, Chris Stevens of New Richmond, WI, grew a pumpkin that weighed 1810.5 lbs. to take home the 2010 prize at the Stillwater Harvest Fest in Stillwater, MN. But if the last few years are any indicator, the gourd's reign will be short lived. Back in 1981, the largest pumpkin ever recorded was "just" 460 lbs. But Stevens's 2010 monster was more than 200 lbs. heavier than the 2009 winner. So it would seem that a 2000 pounder is is very real possibility this year. That's a one ton pumpkin folks. Are you kidding me?! Of course most pumpkins are of a much more manageable size, at about 5-10 lbs. They are members of the genus Cucurbita, which is in the gourd family. These particular gourds are native to North America, and like many New World crops, the pumpkin's origins are unknown. Seeds dating from 7000 to 5500 BC have been found in Mexico, and remain the oldest evidence of the species existence. Once introduced to the rest of the world, their popularity surged and can now be found on all continents except Antarctica. They are used for everything from agricultural feed (chickens love 'em) to human sustenance like soups, breads, and of course pies. I for one cannot sustain without pie. Others of course are purely decorative, and are destined to be your Jack-O-Lantern in a few weeks - if not sooner. These pumpkins are typically of the Connecticut Field variety, and are familiar to just about everyone. But the giant pumpkin varieties are in a league of their own. The story goes that giant pumpkins were first created by crossing hubbard and other large squashes with the kabocha pumpkin of Japan. The hybrids were then crossed back with rounder pumpkin varieties, and their size just kept getting bigger and bigger each time out. Eventually they were classified as Atlantic Giant, since most of this pumpkin upsizing was occurring in eastern North America (go figure). Then in 1981, Howard Dill of Nova Scotia (the giant pumpkin capital of the world) produced a 460 lb., pumpkin which shocked just about everyone who saw it, and made it the largest fruit in the world. For a time Dill actually held an exclusive patent on the Dill's Atlantic Giant seeds. Even today, all Atlantic Giants are derived from his stock, making him the Giant Pumpkin King. He should consider going into the giant pickle business next. Anyway, all of the giants went into the ground back in July, and are just now starting to tip the scales. Growers from all over the world are getting ready to cut their trophies from their vines and see if they can top 1810.5. Just two days ago at the Ohio Valley Giant Pumpkin Growers Weigh-off, Carol and Dave Stelts hauled in a 1,807.5 lb. monster from Edinburg, PA. Not sure what you do with the second largest pumpkin ever grown, unless you also happen to own the largest chicken in the world, or can team up with the guy with the largest pie crust. Either way, it would seem that a new record holder will roll onto the scales some time in the next two weeks or so. Of course you can't count out Chris Stevens as the reigning champ, and keeping an eye on the Stillwater Harvest Fest in Duluth this weekend is probably not a bad idea. If you want to see it in person, you can get a timeshare rental at The Village at Izatys in nearby Onamia, MN. It puts you about an hour away from the festival and in a really beautiful part of the country. Giant pumpkins are a bit too passive for me. Sure I'll place a wager on this year's winner (the over/under is 1950 lbs), but I am more into punkin chuckin. Do you know about this? 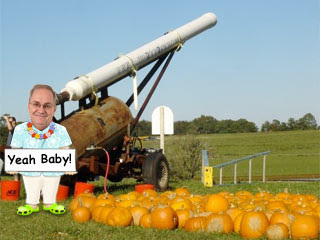 Every year contestants from around the world descend upon the tiny hamlet of Nassua, DE, for the World Championship Punkin Chunkin competition. Contestants enter to see who can hurl a pumpkin the farthest via an air cannon. The current record, set in 2008, is 4483.51 feet, by a team called Young Glory III. That's 3/4 of a mile folks, and it is totally awesome! The technology does not yet exist (at least not in civilian hands) to shoot giant pumpkins with an air cannon, but when it does, I am so there.